Ever wanted to see what a Sci-Fi Bad Boys movie would be like? That’s kinda what the Bright is like minus most of the comedic flair. 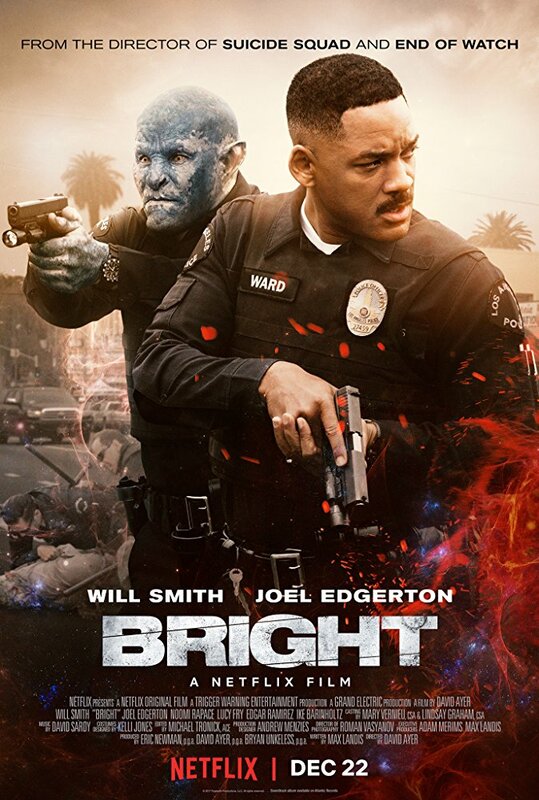 Bright is what you get when you try to make a Bad Boy esque Sci-Fi film but choose not to add Martin Lawrence… In other words cut out 50% of the comedic elements and, add Orcs and Elves. Ending is a bit of a let down. Warning Spoilers Ahead!!! Okay so the story of Bright is pretty straight forward; Brights are special people who are capable of wielding wands without exploding (This is my guestimate being it was never fully explained). An evil Elf and current owner of the wand temporarily loses it and it is recovered by a young elf who Will Smith and his partner find pretty early in the film. Oh yeah about that, so Will Smith is playing a Cop who is partnered with an Orc who is hated by both his fellow officers and the Orc community. Over time they grow to trust each other. Flash forward to half way through the film everybody is after the Wand as well as the crazy elf chick who was the owner of it. Cut to the end, Will Smith and the Orc battle it out with the crazy elf, and Will Smith comes to realize he is a Bright himself and kills her with her own Wand… Yeah… So the more i recall the film the more i see issues with it. 3 / 5 is a generous score when comes to the Story. Originally I didn't have an issue with the way the costumes and makeup looked in the film, but after looking at it now I feel like little thought was put into it. All the Orcs look they are wearing modified Freddy Masks. All the money they have spent on the film could have been used to Implement CGI a bit better. Admittedly I’m a sucker for 90’s and boom-pap hip-hop and, that's about 95% of the soundtrack played through the movie. On the acting side it is basically what you would expect. Nothing terrible, nothing great. If you like fantasy films (like i do) give the movie a watch, but don’t go in with high expectations. If you hate Fantasy films, or buddy cop movies this is not for you.